Reva Patwardhan is a colleague and founder of Dialogue Lab, which helps leaders influence and collaborate to build resilient organizations, and unstoppable movements for social change. In this podcast, she interviews documentary filmmaker and director, Lee Mun Wah (“The Color of Fear”) on how to boldly face racism. How do you get the courage and compassion to stand up for those being targeted because they are perceived to be different and thus make you and others uncomfortable? CNN News commentator and former Fox News contributor, Sally Kohn knows what it’s like to be the object of hate. From her own personal experience, she also knows what it’s like to be a hater. 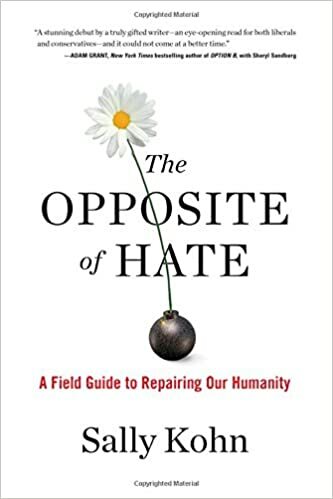 Kohn’s book, “The Opposite of Hate: A Field Guide for Repairing Our Humanity” is a timely read particularly in this time of polarization and dehumanizing behaviors. Kohn examines her own experience as well as researches all the ways that hate plays out in our current world. We all are capable of hate. It’s part of our humanity. Once we accept this truth about ourselves, we can then work with it and defuse its deadly impact. “Hannah Gadsby: Nanette” turns comedy upside down and will leave you laughing, crying, and schooled about life in a totally unique way. Gadsby is a brilliant storyteller who will rock you to your core. Watch the entire video (here’s the trailer or watch on Netflix). She builds the tension masterfully for a knockout ending. This is a must see, must feel video experience!